National youth sprinter Jevina Sampson made her mark at the North Zone Inter-Schools Championships for Zone Two yesterday at the Police Sports Club Ground, Eve Leary. 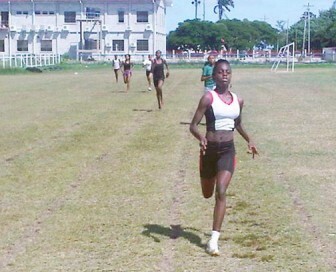 Just 13, Sampson, who has asserted herself as Guyana’s most talented young athlete, had no difficulty winning a sprint triple in the under-14 females category at the Inter-School Sports which has qualified her for the Inter Zone event tomorrow. Sampson, who competes for the Running Brave Athletic Club (RBAC), easily ran away with the 100, 200 and 400 metres events clocking 12.8s and 26.5s in the 100 and 200 metres respectively. Shaquan Daniels, also of the RBAC, was not to be outdone by her teammate Sampson as she too captured a sprint triple, claiming the 100, 200 and 400 metres events in the girls under-16 category. She clocked times of 12.9s and 26.8s in the 100 and 200 metres respectively. Daniels also ran a brilliant 400 metres second leg on her St. John’s High School relay team, which allowed her team to lap another school in the relay event. Reemerging youth sprinter and former Schools National gold medalist, Arinze Chance, signalled his return to competitive Track and Field when he claimed a sprint triple. 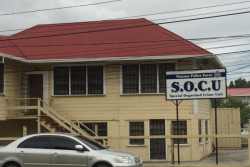 The Police Youth Club athlete comfortably won the boys’ under-16 100, 200 and 400 metres, clocking 11.6 and 23.8s in the 100 and 200 metres respectively. The under-18 category saw former national youth sprinter and former national under-15 cricket all-rounder, Kareem Naughton taking the boys’ 100 metres in fine style as he clocked a time of 11.5s. Returning to the 200 metres, the lack of training and speed endurance was evident in Naughton’s run as he was unable to capture a sprint double, placing second to Jamal Joseph. Inter-Guiana Games (IGG) basketball selectee, Neil Gordon missed his chance of capturing a sprint double in the male under-20 category after winning the 100 metres in 11.6s, he failed to get out of the blocks in the 200 metres. National table tennis player Chelsea Edghill also got into the mix of things by winning the girls under-16 1500 metres without any challenge from the rest of the field. Christ Church Secondary and St. John’s High School exchanged positions in the under-14 medley events. St. John’s persevered to win the male 1500 metres medley over Christ Church while Christ Church returned the favour in the 800 metres medley by hammering St. John’s into second place. 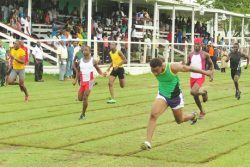 The 4×100 metres male and female relays were dominated by the new school, Chase Academy, which emerged victorious in both events. Chase Academy then returned to take the male 4×400 metres relay while St. John’s dominated the female version of the race. The Inter-Schools championships for North Zone will continue today with the powerhouse school St Stanislaus College taking to the track for Zone Three.